Assembly Members will observe a minute's silence in the Senedd and be given time to pay tributes to Nelson Mandela. The Assembly's plenary session will begin earlier than usual in order to accomodate the tribute session. MPs paid their tributes in the Commons on Monday. 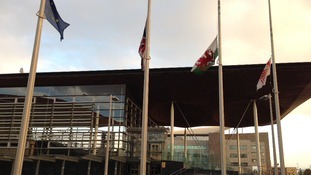 Flags outside the Senedd will again be flown at half mast and a book of condolence has also been opened for AMs and members of the public to record their own tributes. Prince Charles said he has "nothing but the happiest and fondest memories" of Nelson Mandela and that the world "will be a poorer place without him". The Prince of Wales smiled as he recalled meeting Mandela in South Africa with the Spice Girls, which he said was "very enjoyable". "We owe him an enormous debt of gratitude for what he's managed to achieve in his life", he added. People across Wales whose lives were touched by Nelson Mandela have been paying tribute to him today. The South African statesman has been called a 'beacon of liberty' and a 'global inspiration'. His death has also rekindled memories of his visit in 1998, when he was awarded the Freedom of the City of Cardiff in the castle grounds. A minute's silence will be observed in the National Assembly and AMs will be able to pay tributes to Nelson Mandela when they meet again on Tuesday. A book of condolence has also been opened in the Senedd. Flags have been lowered to half-mast outside the Senedd today and will be lowered again on the day of Nelson Mandela's funeral - Sunday 15th December. One man who knew Nelson Mandela better that most was the Neath MP and former Secretary of State for Wales, Peter Hain. He and his family were forced to flee South Africa in the 1960s because of their support for the then-jailed anti-apartheid leader. Our Political Editor Adrian Masters has been to meet him. The funeral for Nelson Mandela will be held on Sunday December 15th in Qunu, it was announced today. Betty Campbell, from Cardiff, was Wales' first black headteacher and an anti-apartheid campaigner. She told ITV News how meeting Nelson Mandela influenced not only her personal life, but also her professional one. Betty said: "What a great man he was during his lifetime. I know there's a lot being said about him on the worldwide stage, but I don't think people realise the affect he had on ordinary people in the street; on children in school. "Look at what he went through - but he still came out on top. I think if that philosophy can be embedded in our kids, then most of them should do very well in life."